The journey towards Social Leadership takes us through nine stages: we CURATE our space, choosing the stage we will perform from. We develop our STORYTELLING skills, learning how to structure the narrative and tell stories that are relevant and timely, interpreting the world around us to create meaning. We SHARE those stories wisely. Social Leaders work around Engagement to build their REPUTATION, founded upon their stories and shared in COMMUNITIES, where they actively participate in the discussion. Their AUTHORITY is based upon their reputation, not hierarchy or position. Social Leaders recognise the facilitating power of Technology and have high SOCIAL CAPITAL, as well as actively developing that in others. They CO-CREATE meaning, recognising that the process of consulting and participating in community makes them stronger and they COLLABORATE widely, with humility, with no expectation of reciprocity. Social Leaders are agile, fit for the Social Age. These are skills that we can develop, but they’re based on recognising that the fundamental nature of work and learning is changing. We have to master the Foundation of the Social Age to be true Social Leaders. 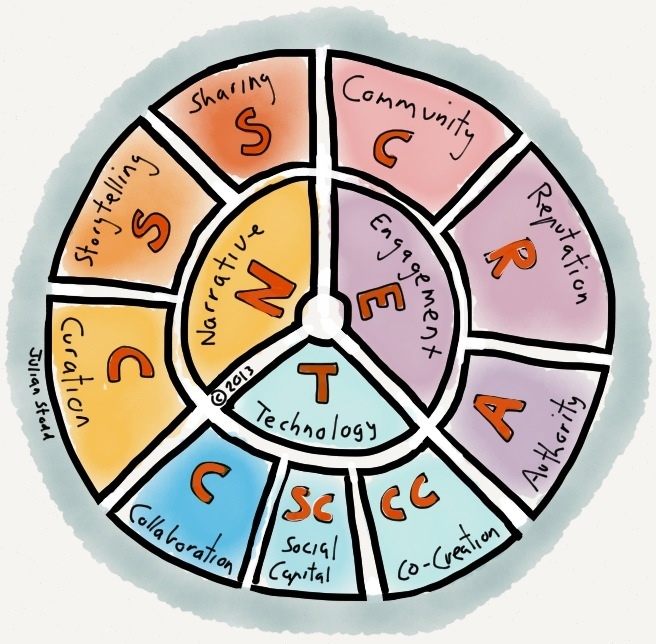 This entry was posted in Agile, Leadership and tagged Agile, Authority, Co-creation, Collaboration, Community, Curation, Leadership, Narrative, Reputation, Sharing, Social Age, Social Capital, social leaders, Social Leadership, Stories, storytelling. Bookmark the permalink. Right on, Julian…I just wish I worked in a world where this was valued. In corporations that haven’t figured out this is the new leadership, we have to just bide our time and practice this everyday until the light finally goes on. The most catchy points that gained my attention were – 1) reputation is the source of a social leaders’ authority, and 2) that they collaborate widely without expectation of immediate reciprocity. Both these points are, I believe really very important qualities of any (not just social) leader in general; but in the current context – i.e. for social leaders in particular – they assume utmost importance. This makes me think that true leaders are really social leaders, since according to the picture here, they earn leadership because of having repute and not because they have been conferred a formal authority or designation! A true (any) leader is supposed to be one whom people admire and want him/her to lead; not necessarily someone who has that designation and sits high in their organizational hierarchy. Thanks, Julian. 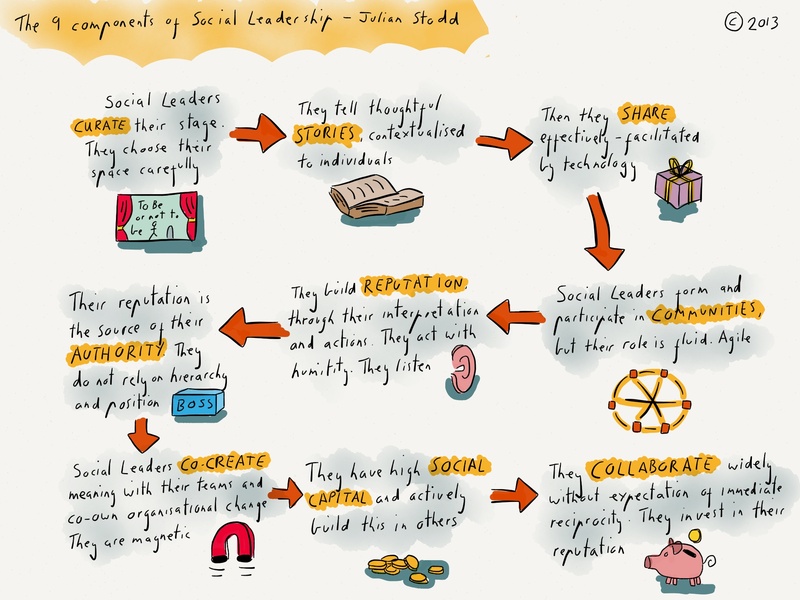 I find concept of social leadership interesting; would love to get involved.